April 2013 Budget Roundup = Increase of + $9838.48 or + 4.83% | Save. Spend. Splurge. Heard this in The Bay of all places in the men’s section. Did a Shazam on it. It’s the only song I like from the band. Saw her rap on The Rachel Zoe Project, and it’s just a good song. Catchy. Heard this on a lingerie commercial of all places, but I love it. Apparently it’s Kim Kardashian’s song? Whatever. It’s catchy. I only really like the chorus, the rest is a bit too 80s for me, but still. Heard this in J. Crew about 4 months ago and couldn’t get it out of my head. I was too late in figuring out what they were singing (it was near the end and I don’t have a smartphone), and it wasn’t until I heard the original, retro version by Daryl Hall and John Oates “I can’t go for that” in the telephone music while waiting for PC Financial to fix my banking problem, that I got the lyrics and found the cover. Truthfully, a very stressful month on the family/personal and work/career side, but I made it and that’s what matters. 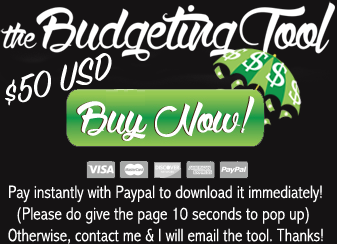 I also totally effed up my Budgeting Tool website (somehow) on April 29th, and I spent all of April 30th and May 1st trying to fix it. I still don’t even know WTF happened. I am also starting to seriously consider a few changes in my eating habits, such as switching to whole wheat flour and brown rice (this is a hard thing for me), and eating a lot more vegetarian meals than I have been doing before. This month in particular was a lot of spending for me. A LOT OF SPENDING… but a lot of returning as well, so it evened out. “Austere April” indeed. I didn’t spend THAT much, but it was in the $2000 range (aside from taxes). Hope the weather stays as nice as it has been lately! To be brutally honest, unlike other previous months, I wasn’t particularly focused on making any extra income. I admittedly put in very little effort and time because I was consumed with bidding & interviews for a contract in my real career that all ended up falling through due to skittish clients (economy fears), and bad timing. The bulk of this amount were my taxes to Canada and the U.S. in the amount of $4323.31. Taxes are what held me back from having an even higher net worth gain this month due to the stock market rally. Big.. fat… tax… bill…at 67% of my spending this month. If you want to know what your focus was this month, look at where you spent the most money. I thought my mom needed more plates. I forgot that we also use dinner plates to prep food, and it’s a hassle to have to clean them afterwards just to use them to eat. Otherwise, all of it looks pretty normal. We bought a Kitchenaid Mixer, and another set of household plates and cups (this time for ourselves). We might keep the mixer, we might not. We’re going to take it for a test run some time this month and if we don’t like it, it goes back. …this means if I didn’t have to pay about $4300 in taxes this month, I’d be up over $13,000 this month alone from the stock market. On a higher note, my net worth is the highest it’s ever been in the history of my net worth. Look at where I was in April 2012 last year! All the way down there at $187,000. These comparisons are just from March 2013 to April 2013, not for the total amounts. So when the stocks dropped BELOW par in March, they went back up to par and beyond, which resulted in a nice, fat looking 58.85% of capital gains. Very misleading as a stat. So lest you think I’m some sort of brilliant stock picking genius, I AM NOT ONE. It is easy to make money when everyone is making money and it is easy to gain a lot of money in significant chunks like this, when you have a lot invested in it. This was mostly luck and not what I expected. I wasn’t expecting such a turnaround in a month, and I am well aware it could drop just as easily in May. ….but let’s hope this momentum lasts for the rest of 2013! Obligatory Disclaimer: Don’t buy anything just because I bought it or it did well in April. In March, they all pretty much tanked, so it can go up but it can also go down. Do your own research. My top gainers are currently at about a profit of $1000 – $1700 each right now. I’m keeping them until I feel it’s time to sell. I have target prices for each, but the more I read, the more I change my target price of when I want to sell them, so I’m taking it easy. Alls I know is once the profit starts to hit a significant number like $5000 – $10,000, I’ll seriously consider taking my money and running for the hills. I’m really down about $300 as total capital losses with these duds. Is a pre-nup really all that depressing? Should I be called out for spending in “PF-unacceptable” categories? 2 ringgit’s worth: My life in US dollars — It’s nice to see someone else’s budget in your currency! Sidewalk Ready has a great dirty hair updo and has a great video on it too! I am hoping something will turn up for May as a job. If not, June to August is pretty much a wash. No one works in the summer in terms of contracts or projects. I’ll have to count on September to have a contract if nothing pops in May, which means I am going to have to figure out something to do in between June and September….. and by “figure something out” I mean take a trip somewhere for the summer. Honestly, I suspect companies are waiting until the July housing reports come out before they invest in projects, mostly because they’re all frightened the economy will tank and they’ll be in the middle of an expensive project, bleeding cash. So what’s on for May? Umm… more spending, but hopefully less than this month. I’ll also be walking around a lot outside, the weather is really getting warm and beautiful! Which model of KitchenAid mixer did you buy? Something to keep in mind about KitchenAid stand mixers is that for the quality has gone down over the years, especially as they became popular as an aspirational kitchen applicance. For example, today’s models use plastic gears instead of metal. Some models also have plastic beaters and dough hooks, which doesn’t bode well for longevity. I bought a heavy duty lift-bowl model several years ago, and it still works fine, but I wonder if it’s because I use it once a month on average. I’ve also never attempted to mix bread dough in it. Now I’m curious. I bought the Classic one, but we opened the box today and as you said, the quality has dropped. My mother had one from about 10 years ago, and hers is impeccably made. Great spray on the dough hook (no weird wobbly waves), and a very solid appliance. 2. The inside of the hooks smells rusty… you know that metallic smell? My mom’s hooks don’t have that stink. 3. The Kitchenaid silver name band around the top, shifts, which makes me uneasy because it means that food or water can get in and rust. 5. When you put the hooks in, they TOUCH and scrape the top of the bowl. I mean SERIOUSLY? I can’t even make anything without that stuff scratching the bowl an scratching metal into my food. It’s being returned, unfortunately, and I am writing a rather nasty letter of reprimand to them. Looks like we are going to buy a professional model, not a KitchenAid, but ones used in restaurants. Oh and all the new KitchenAid Artisans and “Professional” series have the metal bowls made in India instead of Korea (of even LOWER quality), and the whole appliance itself feels flimsy. Ah, good ol’ taxes. Don’t you just love handing over 67 percent of your money to the government? (Insert sarcasm here). I was out about $10,000 from prepaid taxes!!! It’s coming up next week in my “What I bought” post. 🙂 I listed out everything I bought (natural) that I replaced for everyday wear. On occasion I wouldn’t be adverse to wearing my other less natural makeup, but only for special occasions and once in a blue moon. Not daily. I got booted from Google Adsense with no real explanation after about 3 days and they will not listen to my appeal. I do not expect to make my living on my blog but I wouldn’t mind if the internet and hosting costs were covered by ads. I bought Bank Of Nova Scotia in April and the price dropped the next day. I did receive $3 in dividends from another of my stocks. They probably think you were clicking on your ads on your blog. My internet hosting is pretty much covered by Google Adsense which is nice and all I can hope for anyway. $3 is not too shabby! Which stock gave you that? Passionate appeal application has been sent. I did not now nor did I ever click on my own ads. They dumped me from AdSense about a week after I enrolled and I did an appeal then but I am trying again. I have no idea what they want or what will make them change their mind. Is it just some nerdy little guy all alone in a Google cubicle making these decisions and laughing at my plea to have him look at my blog and see how my writing has developed. They want stats but all I have to give them are my Alexa rankings and my monthly views. I have no idea what they want and it seems Google is all powerful and I have no control over anything. TD Canada Trust paid a dividend of $12.75 on 15 shares and Shopper’s Drug Mart paid $3.00 for 25 shares. $12,75 and $3.00 was the total amount I received – not the amount they paid per share. I have TD on my list as well (especially as I am a customer), but BMO looks more attractive..